alpha betic Alpha Lipoic Acid / 60 Caps - Nature's Way®. Why use alpha lipoic acid? 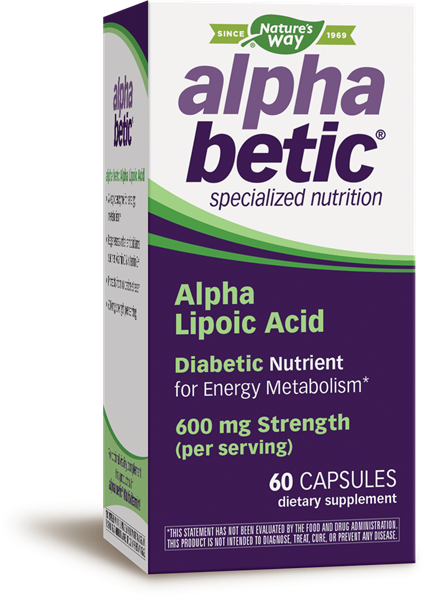 Why use alpha betic® Alpha Lipoic Acid? For adults & children 12 years of age and older, take 1 to 3 capsules once daily or as recommended by a healthcare professional. Caution: People with diabetes should regularly monitor blood glucose levels. If you are pregnant, nursing or taking any medications, consult a healthcare professional before use. Specifically balanced to meet the unique nutritional needs of people with diabetes or pre-diabetes.